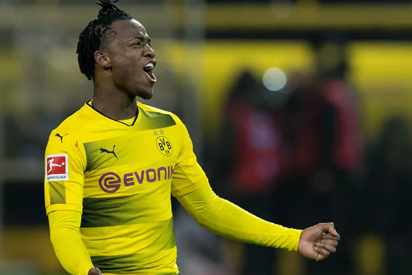 Borussia Dortmund striker Michy Batshuayi is set to miss the rest of the season — and possibly the World Cup — after injuring his ankle during a defeat by Schalke at the weekend. “Well, it’s not good news for now, my season is probably over and I won’t be able to pay Dortmund back for their confidence,” Batshuayi, who joined the Bundesliga club on loan from Chelsea in January, wrote on Twitter. Batshuayi injured his left ankle late in Dortmund’s 2-0 defeat at Schalke on Sunday and left the stadium in Gelsenkirchen on crutches. Dortmund, who have four league games left, put out a statement on Monday saying Batshuayi is “probably” out for the rest of the season. However, the club added he could “possibly” still play for Belgium at the World Cup in Russia which runs from June 14 to July 15. If Sunday’s defeat proves to be his last Dortmund game, then it is a sad exit for Batshuayi who is on loan until June. The 24-year-old scored nine goals in 14 games, including seven in the Bundesliga, after arriving at Dortmund as a replacement for Pierre-Emerick Aubameyang. His injury would leave Dortmund short of an experienced goalscorer. Despite their defeat at Schalke, Dortmund are fourth in the table — which carries a Champions League place for next season — and have a four-point cushion over RB Leipzig. The post Batshuayi to miss World Cup after ankle injury appeared first on Vanguard News.